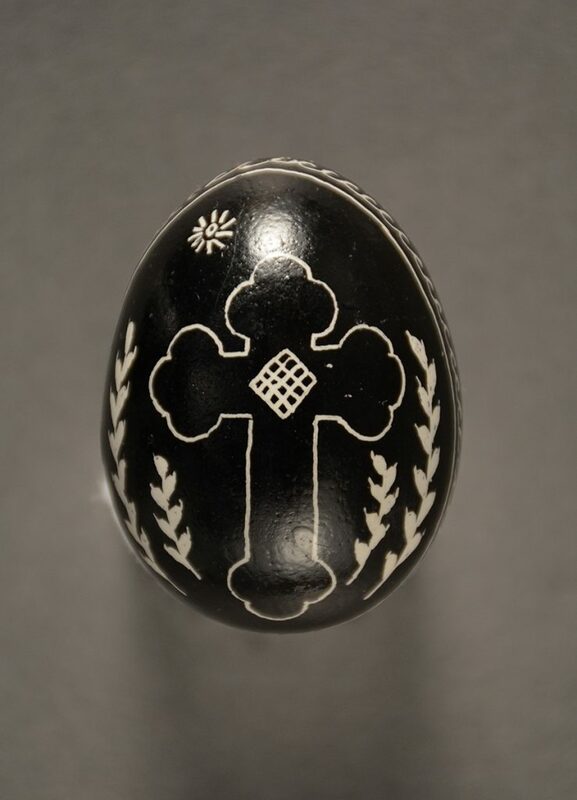 Traditionally, Ukrainians find time in the week before Easter to create highly decorated eggs or pysanky that celebrate the resurrection of Christ. Pysanky eggs made by Helen Timo on display in the Special Collections gallery. Gift of Timo Family. Pysanky’s origins date back to a time before Christianity when the egg, a symbol of life, held great power. With its unending surface, the egg represented eternal life. Eastern Europeans believed the eggs brought blessings of luck to the maker or receiver – the more eggs made, the less evil in the world. As Christianity spread, this symbolism became associated with religion and the Easter season, a time of rebirth both on the calendar, with spring, and in religious practice, with the resurrection. The art of pysanky, which comes from the Ukrainian verb “to write,” is represented in the History Center’s collection. A dozen eggs made by Ukrainian American Helen Timo are displayed in the Special Collections gallery. 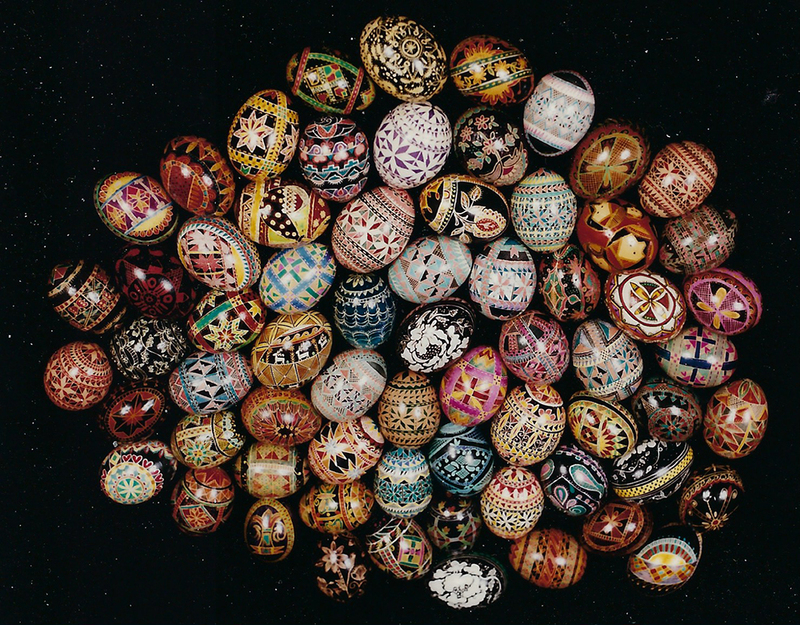 Timo’s mother, who came to the United States in 1905, taught her the art, but Helen updated the process, using a pen point instead of the traditional stylus or kistka, to draw intricate designs on the eggs. Using a wax resist method, the eggs feature natural and religious symbols and markings in both traditional and more modern colors. The eggs are often given as gifts to share good fortune and ward off evil. 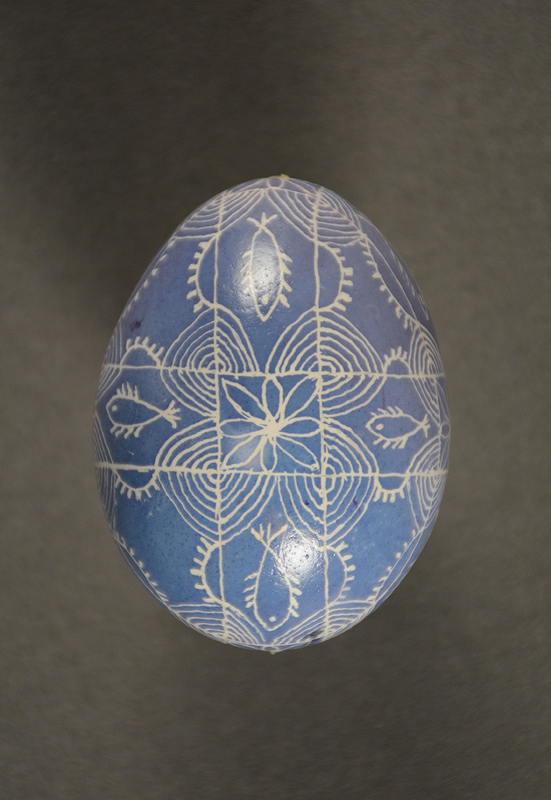 Though the patterning on this egg is traditional, the coloring is more modern. Gift of Timo Family. This egg blends traditional religious and natural imagery. Gift of Timo Family. 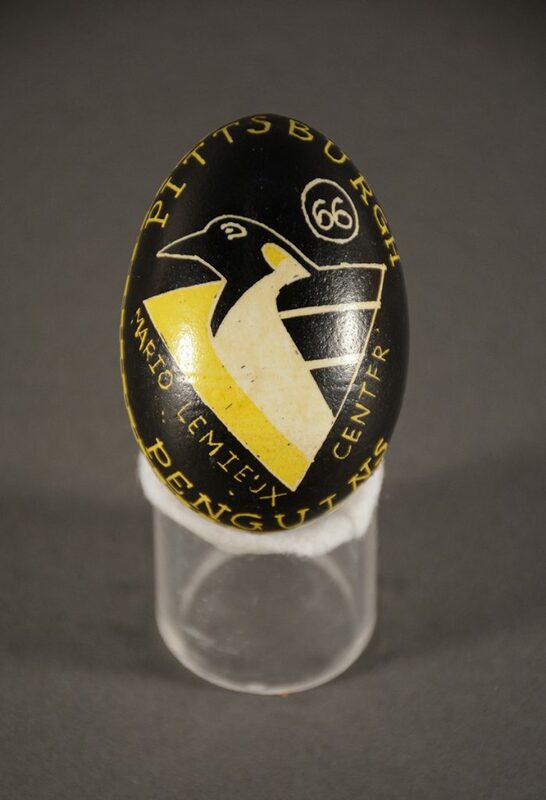 In 1992, Lynda Ellis, the grandchild of Ukrainian immigrants, drew on her heritage to share the good luck and positive symbolism of pysanky with her sons’ favorite team, the Pittsburgh Penguins. The Pens had just won their second Stanley Cup when a package arrived at the team’s offices. Inside were pysanky, created by Ellis. In a letter she sent along with the eggs, she explained their significance and stated her wish that the gift of these eggs would bestow, “a long life, good health, good fortune, and great strength” upon the team and its members. Lynda Ellis drew on her heritage to share the good luck and positive symbolism of pysanky with her sons’ favorite team, the Pittsburgh Penguins. Gift of the Pittsburgh Penguins. Ellis learned the art of pysanky from her grandfather, Andrew “Jedo” Weryha. Growing up in Greenfield, where she attended St. Rosalia’s church and school, she continued to make the traditional eggs. Later, in adulthood, she became so adept that she sold her eggs at festivals in Western Pennsylvania and Indiana, where the family moved in 1995. 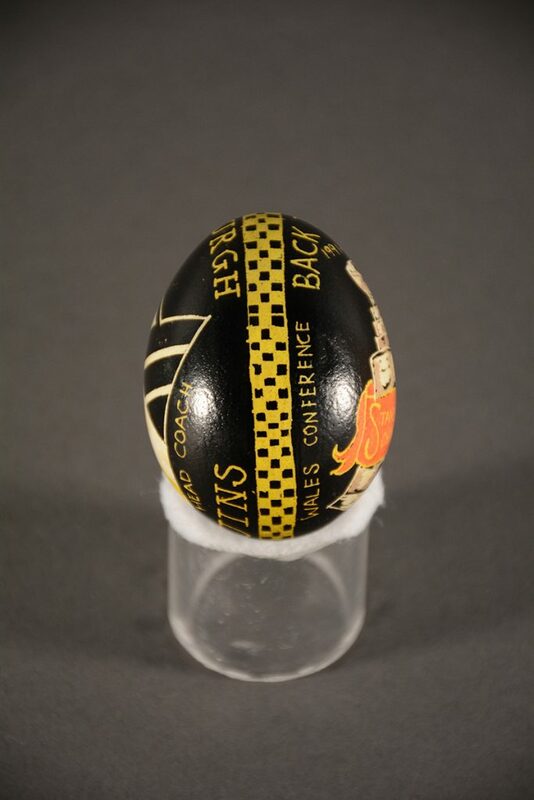 But these eggs for the Penguins were special; she made them to pay tribute to the team’s back-to-back championships and to support her sons, who had become huge fans. Guided by her heritage, she shared these symbolic objects with the Penguins to protect them from evil and bring them continued good fortune. Ellis passed away in 2013, but she did see her Penguins rise again and triumph in the 2009 Stanley Cup. Her sons remain fans and occasionally make it back to Pittsburgh to see a game. Hopefully the eggs, which will be featured in the new hockey gallery of the Sports Museum later this spring, continue to bring good luck to the team. 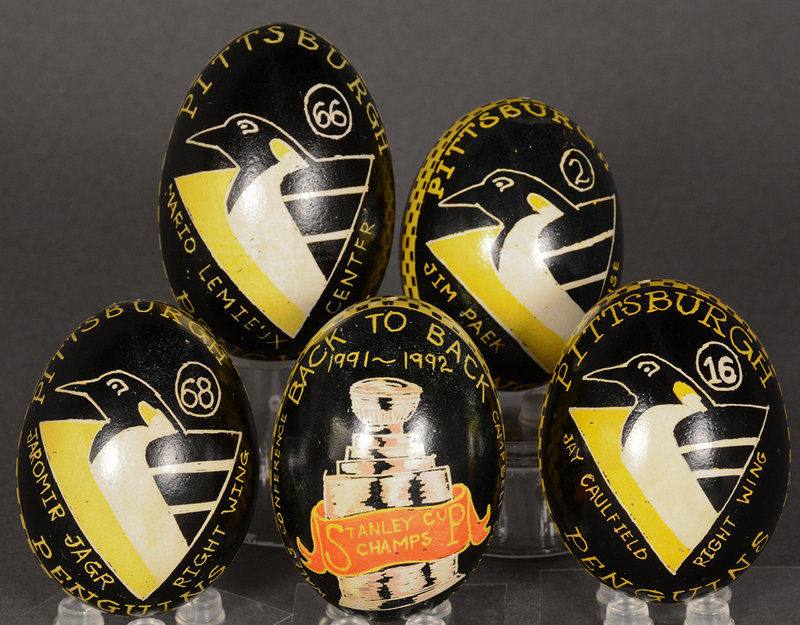 The egg for Mario Lemieux is slightly larger than the others to indicate his importance to the team. Gift of Pittsburgh Penguins. Traditional pysanky made by Lynda Ellis. Photo courtesy of Joe Ellis. Anne Madarasz is the Director of the Curatorial Division, Chief Historian, & Director of the Western Pennsylvania Sports Museum.